My credentials: I have a Ph.D. in Counseling; I am a Licensed Professional Counselor (LPC) in the state of Texas (#67848), a Registered Play Therapist (RPT), and a National Certified Counselor (NCC). I am also a PATH Intl. certified TRI-R and ESMHL. I grew up in Buffalo Grove, Illinois, a suburb of Chicago. I fell in love with horses when I was 2 years old, begging to ride a pony at a local carnival without my mother holding my hand. When I was 9, I mucked stalls and groomed horses in exchange for free riding time. But the journey that led me to start Equine Connection Counseling really began the day Cowman arrived at the barn. He was a former rodeo horse that had a reputation for being strong willed and uncooperative. I believed he was just misunderstood. At the time, I often felt very misunderstood by my parents so we had something in common. Every day I would sit in Cowman's stall and groom him for hours as I told him all of my troubles. Cowman and I soon bonded. When I would leave the stall, he would often grab the back of my shirt and pull me back in. I was the only one he would cooperate with - either in the barn or the riding ring. Over the next few months, some interesting things started to happen. My relationship with my parents began to improve and Cowman started to cooperate with other riders. Cowman and I had formed a mutually beneficial bond that improved the quality of life for both of us. The University of Miami for Bachelor of Science (B.S.) degrees in Psychology and Biology, where I also volunteered at a horse rescue facility and participated as a member of the University Equestrian Team. I have come full circle. My journey started with the mutually beneficial bond I made with Cowman that improved the quality of life for both of us. Now I am helping others tap into the power of the horse-human relationship to do the same. For more information about me, you may download my curriculum vitae (academic resume) here. Brooke Pitts received her Master’s in Counseling from the University of North Texas in 1999, specializing in Play Therapy. Brooke is a Licensed Professional Counselor and Board Approved Supervisor and is a certified Equine Specialist in Mental Health and Learning. A Texas native, Brooke has always loved animals and the outdoors. For the past seven years she has combined this love with her passion for helping others, as an Equine Assisted Therapist. Seen here with her horse Cash, Brooke can be found in the barn, in her garden, or spending time with her family. Brooke’s areas of expertise are trauma and attachment and she has extensive experience treating children, adolescents and adults with a variety of presenting issues. Brooke believes in the healing nature of relationships, both animal and human, and it is her mission to create a safe, healing space for each of her clients. ​Paul Ziehe is a Fort Worth native, born in Fort Worth and raised in Benbrook. He enlisted into the United States Marine Corps Reserve in 1996, rising to the rank of sergeant. He was called to active duty and deployed with VMGR-234 in support of Operation Iraqi Freedom in 2003 and again in support of Operation Iraqi Freedom II in 2004. He was honorably discharged in 2005 and will be forever proud to be a US Marine. He began his horse adventure in 2007, riding at a local stable. From there he began working at a local therapeutic riding facility supporting a veteran’s riding program. He earned his PATH International Registered Riding Instructor certification in 2010 in order to be able to teach a Veteran’s riding class with a focus of Veterans helping Veterans. He has also been an instructor for adults and children at the same facility. Meanwhile, in order to further his equine education, he has worked with a local cutting horse trainer to learn how to get horses started under saddle. He has also worked cattle in west Fort Worth and even taken a trip to New Mexico in 2012 riding and working cattle in the mountains. His latest experience began in 2014 when he started serving as an Equine Specialist for Equine Connection Counseling. Missy Lingerfelt is the daughter of an Air Force Veteran and the wife of an Army Veteran. She likes to say she is from nowhere and everywhere. She is also the proud mother of two children. Her son is currently serving in the U.S.A.F. And her daughter is an M.S., LPC intern. Missy has always had a love for horses but it wasn’t until her daughter showed the same passion that she decided to become a horse owner. This is when she started down the path of natural horsemanship to become a trainer. Through these studies, and the relationship she built with her own horses, she began to see that horses are so much more then just something to ride. She began to see the emotional connection the horse could make with people and how well they could read their human counterpart. She spent the next few years as a horse trainer, starting horses under saddle and teaching horse owners how to build a connection with their horses. In her next military move, she started volunteering at a therapeutic riding center. She volunteered for 4 years as a side walker, helping people with disabilities gain freedom through riding. Once again it was time to move which landed her in Texas. 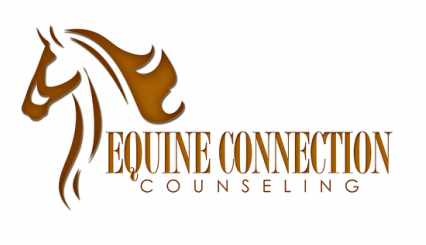 Upon her daughter's suggestion she began her latest adventure as a Certified Equine Specialist for Equine Connection Counseling. Bringing together her passion for people and horses.